Boils, known medically as Furuncles, are simply infected hair follicles or oil glands that develop into a tender lump over time. Most boils are caused by a bacterium known as staphylococcal. Staphylococcal is able to travel down hair follicles before causing an infection at the root. Although boils are a common ailment, they can quickly become extremely painful, especially in areas that chafe when moving. In some cases, boils will need to be 'lanced.' This process involves draining the boil using a syringe. To avoid this nasty treatment, we are going to look at a more natural, pain free approach that involves the use of apple cider vinegar. Apple cider vinegar is a powerful anti-bacterial and anti-fungal tonic that can be applied topically to your Boil for instant relief. 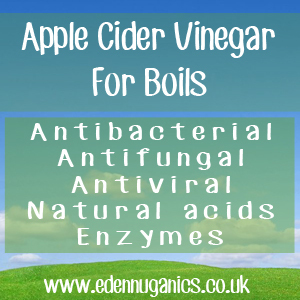 The natural acids found in ACV help to break down the hard protective walls of the boil meaning the ACV get get straight to the root of the issue. Although we do not normally recommend the use of undiluted apple cider vinegar, when treating boils, it may be necessary, but care must be taken. The first thing we need to do when treating a boil is warm up some apple cider vinegar. Care must be taken when heating ACV as the beneficial enzymes will die off if the temperature gets too high. Once the vinegar is warm, soak a clean cloth in the pan, allowing it to absorb the ACV. The next step is to apply your damp ACV cloth to your boil. Apply the cloth whilst it is still warm and allow it to cool naturally. Repeat this twice a day until your boil has cleared and skin is back to normal. It's worth noting that if your symptoms have not cleared after around a week, then we advise you contact your qualified healthcare professional. Over the years we must have been asked this question hundreds of times, and with good reason. Apple cider vinegar is an amazing, healthy, natural tonic that can offer a wondrous amount of health benefits. But only in its raw, unfiltered form. Many commercial suppliers of apple cider vinegar offer only a highly processed, pasteurized version of ACV. Tea Tree Oil - Tea tree oil is powerful stuff. In fact, recent studies have shown that tree tree oil possesses anti-fungal, anti-biotic and general anti-microbial properties. It is these properties that make tea tree oil a great alternative treatment for boils. Black seed oil - Black Seed Oil and its active component 'Thymoquinone' help to strengthen the immune system as well as treat common skin infections including Boils and Carbuncles. For best results, both oral and topical use is recommended. Turmeric - Turmeric is an extremely powerful treatment for Boils that often works when other natural remedies have failed. Make turmeric into a paste using water and apply to the infected area 3 times a day.